Blepharoptosis, also known as Ptosis is one of the most common eyelid disorders reported in ophthalmology. 3 What is congenital Blepharoptosis? 7 What is pseudo blepharoptosis? Blepheroptosis is the abnormal relaxation drooping of one or both upper eyelids with the eyes in primary gaze. When the upper eyelid droops there will be a substantial block of vision in the upper field. Ptosis can be mild, moderate or severe depending upon the area upto which the pupil of the eye is covered. In severe forms of ptosis, the affected eyelid covers the entire pupil resulting in complete blocking of vision. This condition is known as amblyopia. Blepharoptosis present at birth is called congenital blepharoptosis. It may occur due to inherited autosomal gene. Blepharoptosis can be inherited from parents. Both the sexes are equally affected. In most of the cases congenital blepharoptosis are bilateral. Blepharoptosis causes when the levator and muller’s muscles are not strong enough to hold the eyelids in position. This kind of ptosis is seen in patients with myasthenia gravis, ocular myopathy etc. Ocular nerve controls the eyemuscle movements. Any damage to ocular nerve affects the muscles of the eye. Neurogenic ptosis is common in nerve palsy, problems in 3rd cranial nerve, Horner’s syndrome etc. Other possible causes of nerve damage are high blood pressure, diabetes, infection, injury etc. Muscles become weaker in old age. Due to post operative complications of cataract or retinal detachment surgery. occurs due to tumors or edema of eyelids. due to ingestion of snake venoms. This kind of ptosis is an indication of respiratory failure. Blepharoptosis, or droopy eyes is caused due to the abnormal functioning of one or more eyelid elevator muscles. The levator and muller’s muscle are the elevator mucles of the upper eyelid. The levator muscle is innerved by the third cranial nerve or the oculomotor nerve. This striated mucle is approximately 40 mm long and originates from the lesser wing of sphenoid. It branches to skin attachments of upper eyelid creases. The muller’s muscle originates from the lower side of the levator muscle and is innervated sympathetically. It is 12 mm long and helps in elevating the upper eyelids. Blepharoptosis in children can be due to congenital defect or abnormal eye muscle development. Other causes include abnormalities in the eye movement and diseases affecting nerves and muscles of the eye. Pseudo blepharoptosis or pseudoptosis can occur due to a group of disorder that causes eye irritation. Usually get corrected by itself when the causative factor is removed. Obstruction of the upper field vision due to drooping upper eyelid. Headache due to the habit of tilting of head upwards for upper field vision. Blepharoptosis diagnosis is generally diagnosed by the external appearance at the first visit to health care provider. The doctor takes a detailed medical and family history of the patient. Generally this completes the diagnosis of Blepharoptosis. 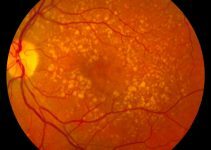 In rare cases, blood tests, a special x-ray and biopsy of a small tissue removed from eye may be needed. Repair of blepharoptosis is performed by an ophthalmic surgeon depending on the type of ptosis. If the ptosis is due to myasthenia gravis, mestinon oral medication is prescribed. In patients, who does not wish to undergo surgery, special glasses made with a crutch attachment to hold the upper eyelid can be used. 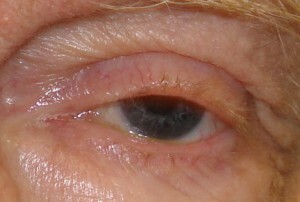 Whether the blepharoptosis is involved in one or both the eyelids. There are different surgical procedures for the repair of blepharoptosis. Tarsomyectomy or Fasanella Servat procedure: This procedure is performed in patients with mild to moderate blepharoptosis. Putterman Mullerectomy procedure or posterior muller’s muscle resection: This is an alternative procedure in patients with mild blepharoptosis who responds well to topical eye drops and has good levator function. Levator Aponeurotic Advancement procedure: This procedure is also performed in patients with good levator function. Frontalis Suspension Techniques: Frontalis suspension technique is performed in patients with poor levator function and intact frontalis muscle. It is commonly done to correct congenital myogenic blepharoptosis. The main goal of surgery for blepharoptosis is to elevate the upper eyelid and make the upper field vision clear. Surgery is conducted in congenital blepharoptosis to strengthen the levator muscle. In case of severe, blepharoptosis in children, patching treatment along with eyeglasses and eyedrops may be recommended. The aim of adult blepharoptosis surgery is to tighten the levator muscle in order to lift the upper eyelid to normal position. In extreme cases of blepharoptosis ‘sling operation’ is performed enabling forehead muscle to lift the eyelid. Blepharoptosis surgery generally takes an average of 30-4o minutes per eyelid. As the incision done is within the creases of the eyelid skin, scar formation after surgery is minimal or nil. Topical antibiotic ointment and oral antibiotics may be prescribed to use post operatively. Recovery after blepharotopsis repair is quick, generally, within a week. Infection- Infection is a possible complication of eyelid surgery as in case of any other surgery. Because of the rich blood supply to the eyelid, operations performed under sterile conditions cause only less chance of infection. Wound separation- The edges of the wound may separate one or two days after the removal of sutures. Smaller separations get corrected by taping the separated parts closer whereas larger separation needs re-suturing. Bleeding- continuous bleeding from the surgical site may need reopening of the wound and cauterization of the bleeding vessel or evacuation of blood clots. Cysts- Milia or small white cysts may appear in the suture line which disappears without any treatment. Excessive skin removal- Excessive skin removal during the repair of Blepharoptosis may interfere with proper closing of eyelids. Insufficient skin removal- Insufficient skin removal may need a further corrective surgery. Scarring- Internal or external scarring can result from poor healing of the wound. Inappropriate crease- Highly placed upper eyelid crease feminizes the looks of males. Blepharoptosis can be prevented to some extent by controlling systemic diseases like diabetes and hypertension which are the major indirect causes of blepharoptosis.